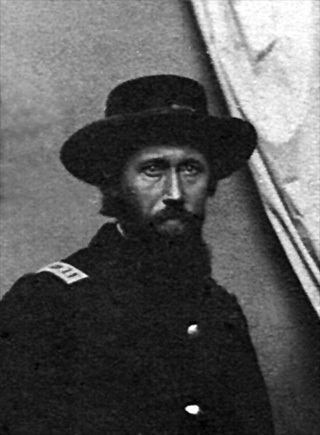 This image shows him wearing a Union Army Officer's hat and uniform coat with the insignia (known then as 'shoulder straps') of a Captain. In the photo on the left his hand is resting on a book, possibly a bible. The original image is believed to have been taken sometime between early September 1864 and June 1865, possibly at Nashville, Tennessee in December 1864. Looking at his eyes, one can imagine the horrors he saw at Resaca Georgia and at Franklin and Nashville Tennessee. An electronic copy of the original image, and written permission to post it on the 80th Indiana website, were provided courtesy of Isum's Great Grandson Kenny Gwin. 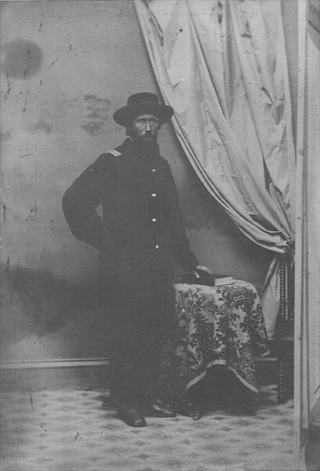 Isum was a resident of Alfordsville in Daviess County, Indiana when he enlisted August 9, 1862 in what became Company D of the 80th Indiana. He was mustered into the Union Army at the rank of 1st Sergeant for a 3 year term of service on September 3, 1862 at Camp Gibson near the town of Princeton in Gibson County, Indiana. He was mustered out of the Army on June 22, 1865 at Salisbury, North Carolina when the 80th was disbanded after the end of the war. During his nearly 3 years' service he served as the 1st Sergt., 2nd Lieut., 1st Lieut., and Capt. (commanding officer) of Co. D and was officially praised for his "efficient, brave, and gallant conduct" during fighting on April 19, 1865, near Decatur, Georgia. All Rights Reserved. Created December 5, 2004. Last updated December 12, 2004.